Tom McDowell believes that the adult world is a far too sombre and sensible place. Children have a very fresh and fun outlook on life and this is something that we as adults can learn from. 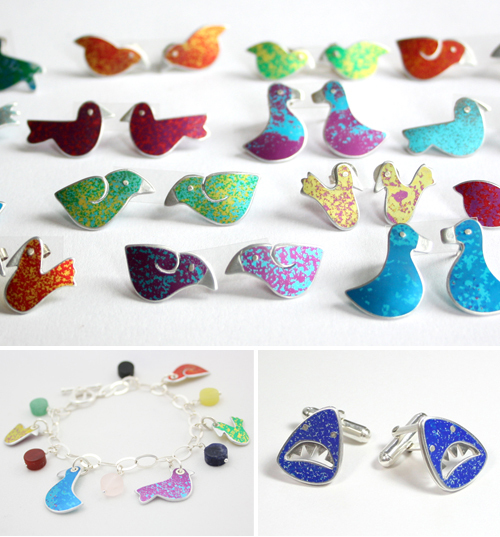 Using anodised aluminium, silver and a variety of different media he transforms children's drawings of animals into quirky wearable pieces. Each creature seemingly takes on a personality of its own, creating a fun environment for both the wearer and those who they encounter. Tom believes that the act of wearing jewellery is too often a formal activity and that it is important for us to sometimes let go of the seriousness of being a grown-up and hopes that by doing so we can make the world more smiley and enjoyable.